York City. We must admit: We didn’t even know there was a tequila liqueur. But now that we do, what a great Valentine’s Day gift for your favorite tequila lover. Agavero Tequila Liqueur, by the makers of Jose Cuervo, is a blend of 100% agave reposado and añejo tequilas. There’s also a touch of the damiana flower, an herb native to Mexico with a verbena-like aroma that is to have aphrodisiac properties (and if you want to believe in aphrodisiacs, that’s fine with us). The liqueur fell out of fashion and wasn’t imported for years. Now it’s back in the U.S., and you should be able to find a bottle in the $15.00-$30.00 range (here’s a store locator). There’s also an orange-flavored version. 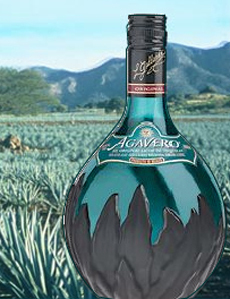 Agavero has the burnished copper color of an añejo tequila, with medium-full body of a liqueur. You’d think from the nose that you were about to drink añejo tequila: The liqueur has similar flavors, but with the light sweetness and silky texture of a liqueur. It is delicious to sip, to add to coffee or to incorporate into cocktails. In a Margarita, use half tequila, half Agavero. Here’s a cocktail perfect for Valentine’s Day, called Besame (Kiss Me). It was created by Sabina and Lorraine Belkin of DUO Restaurant & Lounge in New York City. This cocktail combines sweet and tangy fruit flavors with a tequila bite and a Valentine-red hue. So get out the glasses and the cocktail shaker, and toast your Valentine with something special. 1. MUDDLE limes and raspberries in a highball glass. 2. ADD Agavero; top off with passion fruit juice. Add a splash of Chambord. Put down the flipper and tongs and Let them cook! Cookware from SurLaTable.com. 3. POUR into a cocktail shaker with ice. Shake well and strain back into the highball glass. 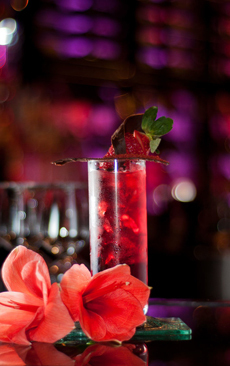 Check out our Valentine cocktail recipes.